Just enter your first name and valid email and then click the Click for 1st Magic Move! button. (All information kept 100% confidential). Allow the next page a few seconds to load. St Andrews "Home of Golf"
You can read 944 testimonials with emails here, also here and video reactions here. In summary, after playing around with at least 6 other approaches to the golf swing, I am now more convinced than ever that the New Four Magic Moves is about the only way to have a consistent golf game. I will now go to the practice tee and work on these moves hoping they will become so automatic that I can then only have to concentrate on set up and alignment on the course which should allow for more wonderful times and less frustration while playing. At 63 years of age, my intention is to shoot my age on or before reaching the age of 66. When using basically the New Four Magic Moves, I have shot a low of 69 which is not too bad for someone who has only been playing for 9 months, eh.. I firmly believe that the New Four Magic Moves will help me shoot some great rounds in the future. Be well Andy and thanks for all the added information that you share with us duffers through your website and emails. My Name is Bobby Asbill and I live in Nashville , TN.I have always been a decent golfer shooting 82 - 86 for the last 3 years. I joined your site and program one night on a whim and here I am writing to tell you how much I have improved and thank you for helping me enjoy golf more. I play once a week and my last four rounds are 76-78-74-78 ...My friends are in total shock and want to know what is going on. My drives are now 310 to 320 and I now hit my LW 120 instead of 75 yards.The game is more fun now and I feel and my friends say it all the time now that I am on the verge of shooting great scores.I played with 3 guys at the club the other day I didn 't know and now I 'm playing in a tournament with them. I must admit that I was a bit skeptical of the 4 magic moves. I teach Biology in the US and always need proof or evidence. I downloaded the free first four chapters and tried things out for myself. I had the opportunity to try things out this weekend and my results are amazing. I was hitting my 7 iron 200 yds without effort and my driver close to 300 yds. Most impressive was the direction of the ball, it is travelling STRAIGHT. I wish golf had been taught to me in this simple manner several years ago. It would have taken out a great deal of frustration. "PROOF That My New Edition Of Golf's Long Lost Classic Has Dramatically Improved Thousands Of Swings ..The Question Is Are You Next!" "23 Handicapper Drops 5 Strokes To An 18 In Just A Couple Of Weeks!" Thanks for the CD's format. Love the audio, listen to it over and over again and every time another bell rings. It has allowed me to go through The New Four Magic Moves a second and third time now and with every review, out comes (what I will call) a new pointer. Wish I had gotten this info 20 years ago. I can't believe how easy your instructions are to follow. Bottom line is you have now got me from a 23 handicapper to an 18 in a couple of weeks. So much so, that my playing partners want to know how much my lessons are costing me. "It Is Quite Amazing The Progress I Have Made Using Your Instruction!" Subject: Re: William - new audio golf book! Just received your new version, it looks great. I have been practicing, and it is quite amazing the progress I have made using your instruction, it really helped when I got rid of all the rubbish I had in my head about the golf swing. Your instructions are very clear and precise. Click On Play Button Twice Now! hrow your fancy titanium driver and souped-up balls in the lake  the legendary pro's like Ben Hogan and Bobby Jones knew how to launch precision drives the length of 3 football fields using hickory shafts and imperfect balls! has been under your nose all the time! My name is Andy Anderson ... and if you love golf as much as I do, then this message is going to change your life forever. Let me tell you about the amazing truth of four simple techniques  hidden from amateurs for decades  that can have you suddenly tapping directly into the hidden power inside your golf swing. And start launching your own breathtaking drives of deep distance and stunning accuracy off every tee box. You can now master the secrets to instantly curing slices and adding distance literally over overnight! and all for less than youd pay to play a single round at your local municipal course! Learn how one simple "magic move" (which you can easily feed into your current swing in just 7 minutes, even if you stink at the game right now) instantly uncorks so much hidden raw power, balance and accuracy... That you can go out tomorrow and launch a pin-point 230-yard tee shot with a 3-wood...From your knees! or, even better, I feel like I just hit the lottery. Discover how 1,000s of golfers worldwide have used these 4 simple moves as their "secret training tool". Sit down, lock the door, and take the phone off the hook. The result of making the right 4 moves in your swing will take your breath away. If you're shooting in the 80s, expect to drop 4 to 6 shots on your next round. If you're shooting above 100, plan on dropping almost a stroke a hole. All it will take is one bucket of practice balls to get where you want to be. It's really that simple. This revolutionary book and 5 hours of audio (plus 6 free bonuses) shows you everything you need to know � a complete course that will slash at least 7 strokes off your handicap ... 100% Guaranteed or Your Money Back. At last, you can discover how to drastically improve your golf swing, unlock your hidden potential, save your money on expensive lessons and stop wasting your time on the driving range. while the next afternoon my game would absolutely go all to hell. I swear I've stood at the edge of the lake, holding my bag overhead, one emotional hair-trigger away from tossing the whole mess and never stepping up to another ball the rest of my life. Let's face it, mastering the finer techniques of golf is tough! Of course, some people will tell you they can do just fine without properly understanding the golf swing. WRONG! Just take a look at their own golf results. Their scores speak for themselves! I can HONESTLY say that almost everyone I see on the golf course and range is "dead wrong" when it comes to practicing their golf swing. Success You Should Be Getting!" Not only that, you may be wasting hours of your time and energy each week at the driving range because of improper swing techniques robbing you of the improvements you could be making. ... Just by making a few small changes to your swing, you will radically transform the way you play golf. It's true. I have recevied over 865 testimonials in 3 years from golfers like you who have gone on to cut their handicap. And you can too, using these four little-known swing techniques you can also take your current game and "twist" it to reach your full playing potential. because here's a few of the powerful techniques I would like to show you. And that's just a sample of the proven and tested techniques you are about to learn. By the way, these insider secrets I'm about to reveal to you aren't something you'll discover casually while reading a golf magazine. And I know damn well your local golf pro won't tell you! They're closely-guarded secrets so golf professionals can make even more money by selling you more and more lessons! Skeptical? - Trust me I completely understand. Franky, I don't blame you - in your shoes I would be too. I've been playing golf for over 29 years now and I've seen a every piece of hyped up and exaggerated claim you've also probably seen. Trust me, there's tens of thousands of professionals out there, telling golfers how to swing incorrectly. That's why you need absolute and detailed proof that these four simple moves are 100% trustworthy and reliable. So let me share with you the extraordinary results some of my clients have witnessed by transforming their golf swings. "Four Strokes Off My Handicap In Two Months"
"Thank you Andy. After a few short hours reading your book and listening to the audio files I knew the exact changes I had to make to my swing. In the last two months I have knocked four strokes off my handicap. I can't believe how easy the game of golf has become. As long as I don't forget the four magic moves I know my game will continue to improve. I have recommended your course to all my friends at the club." Well My Game Has Improved!" "Once I Had Mastered Move #1 I Immediately Started To See Drastic Changes In My Score!" "I have played golf for over 25 years , and in that time I have I have read nearly every golf instruction book you have ever heard of. I can confidently say that without fear of a lie that your book is the best coaching manual I have read. Your writing is effective and easy to understand. Over the last four months I have seen my handicap drop by 8 strokes, down to 9.8!" "This Is An Amazing Book!" "I thoroughly enjoyed listening to the Four Magic Moves on the way to work. It was both entertaining and informative. Over a few short days I was able to understand the 4 key moves I needed to make to my swing. This is the first time I have been able to visual the perfect swing and not surprising I am starting to see my handicap drop. Only last Sunday I had 40 points in a club stableford competiton. Thanks Andy for providing this valuable resource!" I'll prove to you why you can trust me to show you how to achieve astonishing results in your golf game. "Why Should You Listen To Me? What Is So Special About Me?" My name is Andy Anderson. I'm a company director living in Fife, Scotland - just 15 minutes from the Home of Golf at St Andrews. Previous to setting up my own company in 2002 I worked exclusively in the golf industry for nine years. During this time I worked for Tiger Wood's management company IMG in London and the European Tour based at Wentworth in Surrey, England. Online, I've had the pleasure of helping just over 13,270 people worldwide realise their dreams of significantly cutting their handicap. I created this web site to ensure you don't waste all your years on the range like I once did. One thing is for sure, I don't want to see another golfer fall for all the so called expert advice out there. You need to know the truth about what it really takes to propel your game further than ever before. Agreed? After all isn't it right you focus all your efforts on chopping strokes off your handicap, rather than being left in the dark about how to change your swing? That way, you don't continue to waste hours on the range for little or even worse no result. What's more, I'm a normal person and certainly not the perfect height for golf at six foot five. Like you... I haven't got the athletic build of Tiger Woods or the dedication to put in many hours of practice like Vijay Singh! And that's not all, I wasn't lucky enough to be born with natural sporting ability. I never won any junior golf events throughout my teens and I was convinced I would never be able to improve. In conclusion - I'm your average guy. Just a few short years ago I moved to the Home of Golf, that's me above on the Swilken Bridge on The Old Course at St Andrews. Probably just like yourself - I was continually looking for a way in which I could change my game forever. I guess I was like a sheep following the rest of the flock. I can't tell you the number of times I burnt a hole in my pocket convinced I had found the next "all singing - all dancing" golf improvement course. I bought all the magazines and DVDs, and everytime I would fall for the latest golf trainer product - you should see my garage! Ultimately it was complete frustration, I was going around in circles. Each time I would spend money I hadn't got, then waste countless hours on the range and see no improvement at all. In fact sometimes my scores would get even worst! However many golf lessons I had, however many golf DVDs I watched, however many golf magazines I read, however many times I practiced - I never seemed to get better. If you keep doing the same things, youll keep getting the same results. If you want a different result then do something differently. It struck me that I could achieve anything I wanted by learning how to do it and that included becoming a much better golfer. My Handicap And Over 944 Other Golfers!." So, off I went in search of information and advice to help me significantly improve my golf swing. I was on a mission to discover why some people found it incredibly easy to lower their handicaps whilst the vast majority struggled. I searched online, offline, in ALL of the local book stores and was about to give up and think of ways to sell my clubs on eBay when by chance I stepped inside a second hand book store in St Andrews - right next to the Old Course - 15 minutes from where I live. After another hour or so of what I assumed to be a fruitless search something caught my eye ...... and within minutes I was completely engrossed in an incredible book that I knew instantly was the answer I was looking for! I'd stumbled across a book that showed a unique and simple way to play golf. "... I Had Finally Found The Answer !" There's an ugly little myth shared by most amateur golfers that is causing you to absorb up to a dozen unnecessary strokes, each and every round. 1. You watch a favorite professional golfer perform his "patented" swing, paying close attention to every detail. 2. You then duplicate every detail into your own swing, from memory, hoping to acheive the same result the pro does. 3. You then have one of the worst rounds of your life. Hey, I've been a sucker for trying to "steal" pro's secrets all my life. I'll watch a tournament on television, paying close attention to Tiger or Phil or Ernie, catch a little something they do in their swing, and then go out and try to copy it. And I'll bet YOU'VE done the same thing... because, simply, EVERY golfer does it at some time or another. The problem is, you can't "figure out" what the pro is actually doing just from watching, because so much of the swing is "inside". You may think you see Tiger uncock his wrist on the downswing... heck, CBS or Sky Sports may do a slow-motion repeat for you, pointing the uncocking out... but unless you understand WHY he's uncocking at that particular moment in the swing, you'll NEVER figure out how to incorporate such an action into your own swing. That's because Tiger has made a CHOICE. All the great golfers have. More specifically, there are exactly FOUR points in your swing where you also must make a critical CHOICE... and everything that happens in your swing will be affected by these four choices. It's like deciding which roads to take on your commute to work tomorrow. It may seem like a simple choice at first, but everything that happens to you after that choice  queues, long delays, speed cameras, road works will be directly related! The reason professional golfers are making fabulous incomes playing golf and you're still trying to drop your handicap to single digits is because the pros have made good choices at each of these four vital points in their swing... and you still don't know there are choices to be made. ... the bad swing is caused by a failure in execution at four critical points. Furthermore, golfers make the same mistakes at the same points, and this is true whether you test this principle with two golfers or two thousand. These are called the Four Fatal Flaws. Most poor or mediocre players manage to incorporate all four into one swing. Others have fewer, and score better. I learned that these Four Fatal Flaws had to be replaced with the right actions, namely the Four Magic Moves! "H A L L E L U J A H - I Suddenly Realised ...!" ... With the four right moves instead of the four wrong ones my swing would be better, my mistakes fewer, and my scores lower. And this is exactly what happened ..
" ... My Handicap Plummeted In Less Than Four Months!" and I became absolutely fearless on the links, going after every shot as if I had magical powers. and everything to do with the amazing new swing developed by one of America's best-known teaching professionals Joe Dante (former president of the New Jersey Professional Golfers' Association) over 40 years ago. Known as the professional who spill the beans on the secrets other pros don't want amateurs to ever find out about (subscribe to my newsletter to find out the 25 golf fallacies golf pros tried to keep hidden for so long). Joe played with  and beat many of the best golfers in the game, and spent a lifetime learning the science behind the pro game. When he decided to reveal his advanced secrets, smart golfers paid real close attention. ... I Felt Like I had Been Hit By A Lightning Bolt! ..."
My golf improved so much that friends started to ask me how I had managed to completely transform my swing! In fact , I knew sooner or later I would have to start lending my book out! This is one thing I didn't want to do - I knew they wouldn't return it! Friends would buy me a beer so as I would spend some time helping them with their swings. "Why Not Make The Secrets Available To EVERYONE?" That saying kind of stuck with me, because I felt the book would save me time and allow me to focus on my own game. So, I took the plunge! "... And Rewrote The New Four Magic Moves To Winning Golf ..."
... Regardless if they have been playing the game 3 months or 30 years! "... Not Only That ... I Had The Whole Book Narrated ..
Amazing Golf Instruction At Your Leisure ..."
I created a simple (yet comprehensive) step-by-step "system" that would allow ANY golfer of ANY standard and playing at ANY level to learn how to use just four simple moves to cut at least seven strokes off their handicap. I promise you, youll notice dramatic transformations in your golf swing almost immediately! Better than if you followed any other training program that so called "Golf Pros" would tell you to do. Moves To Winning Golf" Course? Just this: ..."
Learn to use the natural torque in your pivot to blow right through the ball with accelerating power, just like Tiger Woods and Sergio Garcia! ... Yes, you really can (Most amateurs adopt the "Easy-Chair Slouch" at the top of their bad backswings and guess what they'll never hit a good one from here!. It's unconscious, because most amateurs simply never realized the importantance of this move! YES, you really can unlock your "hidden" power to accumulate in consistent shots over and over again! ...Learn how to hit the perfect inside-out swing naturally - as if you were born with it - You'll never look back once you see your ball still rising whilst your opponent's is dropping!
" ... And Youll Also Learn ..."
All The Secrets of a legendary golf teacher revealed in a clear and concise form. How To Hit The Ball Further Learn the powerful techniques to hit it 20 - 35 yards further! The Bulletproof Method To Improve Your Accuracy Overnight. That's the fun and awesome excitment you will feel ... you will experience first hand how good it feels to play well below your handicap! You Can't Do What My Other Clients Have Done"
They are just ordinary people like YOU. They were fed up with their own golf problems, but rather than just complain about it, they took action. They came to a realization that if they didnt take charge of their golf game, theyd live their entire life fed up about failing every time they stepped onto the course. You too can begin to hit fairways and greens with lazer targeted accuracy everytime, anywhere�without the inconvenience of spending loads of hard earned cash on golf instruction and lessons in the process! ... But only if you reserve your copy now. Of This World Renowned Golfing Classic!" This newly released course called "The New Four Magic Moves To Winning Golf" by Andy Anderson and Joe Dante is the quickest and easiest way to learn golf. Inside this magnificent course you'll get pages and pages of well-written practical golf instruction and hours and hours of comprehensive golf tuition. Absolutely everything any golfer would need to explode their game! By reading and listening to each chapter you will be given a picture and an understanding of the swing, particularly of the puzzling action of the club head, that will be entirely new to you. After dealing with the full swing I go into a detailed description of the short game, including putting, the trouble shots, and, finally, the mental or thinking side of golf. Whether you play when you can, but always regret it afterwards! ... This proven "step by step" easy to follow system provides you with the knowledge, skills and tools you need to rapidly improve your golf swing. Once you discover this revolutionary winning formula � You'll learn how to change your swing more than you ever dreamed imaginable � for many years to come you will find this unbeatable "golf swing blueprint" an indispensable golf tool. Plus, the entire course was created so that an average, ordinary golfer of any standard could learn to apply these techniques to their game. It's truly a fantastic resource that will transform the often confusing subject of the Golf Swing into something that's comprehensive to understand and apply. ". . . NO fluff . . . NO filler. . . NO fat . . . "
.. and long winded golf history lessons! In other words, this incomparable golfing roadmap to success doesn�t go into the history of golf or recap the life of Tiger Woods or any other great player. You won�t learn about the best golf courses to play, or where to buy the cheapest clubs, The New Four Magic Moves is about the most important aspect of golf there is - your swing"
Instead, with The New Four Magic Moves you get what I'm sure you would agree matters most! And that�s a solid, straightforward, step-by-step insight on how you can improve your golf swing! This is indeed a user-friendly course. In one phrase, it's "The golf swing made simple!" "This is the miracle book golf tuition course I have been searching for all my golfing life. You can take all the countless golf books, courses, magazines, video and DVDs I have bought over the years - and bin them - they just don't come close to the impact the four magic moves has made on my game. Each move is comprehensively covered, yet simple to understand - there really are only four actions you need to know. Something I Hadn't Done In Years!" "Here's What the Complete Course Contains... "
Chapter 1. - What You Can Do. Why don't more people play better golf than they do? The blunt truth is that they don't because the golf swing is heavily overlaid with a sludge of fallacy, misunderstanding, faulty theory, myth, and just plain ignorance. So thick is this coating that it is a wonder anyone ever gets through it and down to the hard, clean mechanics of the sound swing. It is this sludge, most of which has been covering the swing for so long that it now acts as an insulation, that I will cut away in this course. Once the myths and fallacies are exploded and the true machinery of the swing is laid bare for all to see and understand, golf becomes a much less difficult game. Chapter 2. - Sweeping Out the Rubbish. Discover the two dozen fallacies of golf that are most prevalent and have caused and still cause the most damage. Particularly those which must be exploded thoroughly if you are to assimilate the new thoughts, principles, and actions given to you in this course. Watch carefully. The fuse is lit! Chapter 3. - Getting Set: The Grip and the Stance. There can be no doubt that the first mistakes a golfer can make are to hold the club with a defective grip and to stand up to the ball the wrong way. Either puts a heavy impost on a player before he makes a move to swing the club. Together they make a good shot almost impossible. Chapter 5. - At The Top. The position at the top of the backswing is important. If it is reached correctly it means you are halfway through the swing correctly. It means that now, at least, you are in a position to make a good downswing and hit a good shot. With most of pupils I can tell pretty well, as can any pro, whether a shot will be good or bad just from their position at the top. will be able to replace the wrong moves and faulty positions with the right ones. When you do, you will cut strokes - many of them - from your score. Chapter 8 - The Short Game. As we see it, the short game falls, into four categories: the short pitch from thirty yards down, the green-side trap shot, the chip from the fringe, and the putt. The technique for this short pitch is the same, fundamentally, as for the full shot, except that it is in a modified form. green with a wood or a long iron. Then we are not surprised when we find ourselves in difficulties. But much more often we stand on a tee, with a wide fairway beckoning, swing - and find ourselves in the woods or heavy rough - isn't it time for a change! Chapter 10 - The Early Break and the Late Hit�Secrets of Timing and Rhythm. The answer to the effort-distance puzzle is timing, but just what is timing? For one thing, it is a word that has been used more loosely, perhaps, than any other in golf literature. We have been blandly told that we should work to improve our timing, that our timing is off, that without good timing we cannot hope to play well. But what exactly is it? Today you will learn the secrets of timing and rhythm. We expose the truth at long last. Decide for yourself whether you want to be left in the dark any longer! A 155 page step-by-step Adobe� PDF file explaining the exact four magic moves you need to make in very simple language - and now with color pictures! Over 5 hours of stimulating audio that offers an amazing insight into how YOU can easily change your golf swing. Download MP3 for listening to on your PC or iPod M4B files for you to listen in the gym, in your living room or out in your garden. In fact, wherever you take your iPod. 56 detailed ilustrations and photographs that offer a visual demonstration of how to improve your golf, step by step. Enjoy the luxury of listening to the Four Magic Moves when you are on the go or relaxing at home. Easily refer to particular points in the book on the golf course with your smart phone! "Relax" - "Use a light grip" - "Be loose" - "Take the club back inside" - "The club follows the same path coming down that it takes going up" - "Pause at the top" - "Turn the hips to the left" - "Keep the head still" - "Start down with a pull of the left arm" - "Have the face open at the top" - "Don't let the body or hands get ahead of the club" - "Be comfortable" - "Break the wrists late" - "Swing the club head" - "Hit against a firm left side" - "Snap your wrists into the shot" - "Hit hard with the right hand" - "Don't drop the right shoulder" - "Hit down on the ball" - "Use your natural swing" - "Follow through" - "Don't quit on the shot" - "Pronate your wrists" - "Pivot the body" - "Positions at address and impact must be the same"
As you can see, the complete The Four Magic Moves To Winning Golf course is chock-a-block with possibly everything you need to improve your game... And a whole lot more! "Amazing - I'm Gaining A Club Extra Distance Since Using Just One Of The 4 Magic Moves!" "The course has helped improve my ball striking. The one that probably helped most is the first magic move whilst starting the back swing, I have gained enough distance, for example, to where I currently hit an 8 iron where I was hitting a 7 iron (150 yards). I'm 62 years old and will be 63 in December, and I think hitting an 8 iron 150 yards is pretty darn good for this old geezer. Thanks Andy." "I Reduced My Handicap From 9 Down to 6!" Ever Happened To My Game!" "Being busy with work and family, I only get to play a few times a year. My game has been steadily getting more and more erratic. Using the Four Magic Moves described in your excellent book has enabled me to improve my game, even though I've virtually no practice time! It's amazing, well done and thank you." The Price Of One Golf Club!" 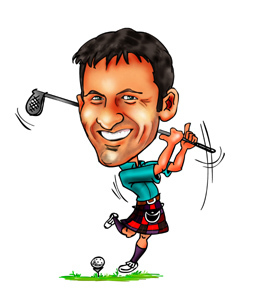 "Truly A Revelation - I Have NEVER Hit The Ball Straighter Or Longer - Thanks Andy!" "Andy, I can honestly say that your golf book has been extremely helpful. After years of being plagued by a slice, your tips regarding grip have been a revelation. As a priority, I have been working hard on grip changes and it has been great to see the difference it has already made. The relief of cracking the ball and seeing it flying straighter and further is great !!! It has given me so much more confidence. I have lots more work to do on other areas that you have advised on and it will take time but please be assured it is very much appreciated and does make a lot of difference. Your advice gives me things to work on during practice and while playing, making the experience very rewarding. New 4 Proven Secrets To A Great Golf Swing"
"My confidence is sky high and only last week I broke 80 for the first time in my life! It's all thanks to "The New Four Magic Moves To Winning Golf". I no longer have to waste my money on any more golf instruction. I shudder to think what would have happened if I hadn't discovered this gem. Thanks Andy!" I'm Hitting Straighter And Longer Balls!" Imagine fine-tuning your current swing and sharpening your golf skills to a much higher level. Get the "edge" and break 90, 80 or 70 today! What would straighter shots and great putts mean to your game? How much better could your current swing be if you knew how to make the four magic moves? Don't take my word for it. Try it! Find out for yourself. Add a copy of "The New Four Magic Moves" to the cart immediately and put what you uncover to the test. You can start practicing down the range, on the course or even in your own garden and home. But whatever you do, I'm confident it will blow your socks off and you will be more than thrilled with your copy of "The New Four Magic Moves To Winning Golf". The only way to tell is if you try it for yourself and see it first hand. Turn Into A Low Single Figure Handicap Player?" Some people buy countless manuals, videos and DVDs that literally cost thousands of dollars, pounds and euros! Other people hire the services of a professional that cost almost the same in the end. What price tag would YOU put on something with the opportunity to show you the steps to start playing like a professional golfer? Frankly, I thought long and hard about delivering this exclusive information only as part of a high-priced seminar where I charge at least $399.59 per person. But instead of going to all the trouble of arranging for a teaching room and golf range and taking time out of my schedule - I settled on an online video, digital ebook and audio course format as a perfect and convenient way to deliver this information (for you and me). Well I have no inventory and no fulfillment costs. I don't have to set up a call centre to take telephone orders, so I can pass my cost savings along to YOU! Don't worry about downloading, everything is a snap and it works for both PC and MAC users plus you still get all the bonuses listed below. At $39.95, I'm sure you'll agree this is an incredible bargain. I truly value you as a long term client and I know you'll be thrilled with the value in this $249.85 package that you'll come back to me and buy from me time and time again, year after year. Think about it for a moment. If you consider the fact that you would spend more than this amount on one golf lesson, then this tiny investment of only $39.95 is more than fair. I have been told that this price is way too cheap! In fact, I might be raising the price very soon. (I'm thinking of testing price points as high as $77 once my introductory launch is over.) So I urge you to get your hands on this course before it's late... I'd hate to see you miss out! I'm also giving YOU tons of bonuses including tips and advice! There you have it - you couldn't ask for a better deal.
" ... Here's The Deal I've Cooked Up For You ..."
I want to treat you like I wish I would be treated when I try something new. That's why, I'm going to give you the chance to "rip me off", if you so choose, without a hint of bad feeling. and try them out in your game to your heart's content. then simply tell me, and I'll rush your money back to you. No hassles, no nonsense at all, no questions to answer. Just boom -- you tell me, and I send your money back to you. and even be eager to see what else we have to share later on. Listen, if you don't agree that this is the most impactful, eye-opening and practical information you've ever received on the subject of golf, simply email me and I'll issue you a 100% refund on the spot. No hard feelings and no questions asked. In fact, I'll extend this guarantee for an entire 2 months after you get everything! That's right, 2 months to use and gain from this unique information and at anytime you can ask (and receive) an immediate refund. And if you decide to opt for a refund I still want you to keep the video, ebook and audio course as my free gift just for giving this a shot. Never Offered Before --Yours for FREE!" I want to make this opportunity even easier by including very valuable bonuses that will really make this the ultimate tool for playing exceptional golf. ... Here's something GUARANTEED to keep you awake tonight. Mike has had the privilege of helping thousands of people including club professionals, mini-tour players, collegiate golfers and senior players, improve their golf performance by strengthening their weaknesses, and reducing their limitations. This bonus is valued at $27.97 and offers some of Mike Pederson's best secrets to improving your golf and fitness. But today, it's yours absolutely FREE as a valued customer of "The New Four Magic Moves To Winning Golf". Not available anywhere else! As a super added bonus to "The New Four Magic Moves To Winning Golf", I'm giving you a FREE copy of my ebook, "The Top Thirteen Sure-Fire Ways To Hole Every Putt"
This ebook will enable you to practice your putting with a real purpose. This is your chance to discover 13 proven methods to instantly improve your putting - these are the very same drills that the top pros use to stay on top of their game. Access the top drills use by the world's best players! There are many different types of putting training aids on the market today, but for the purposes of this book I concentrate on tools that are easily accessible. Thus these techniques are great if you want to quickly practice on the practice green before you go out to play. Don't Miss These "Never Miss Again Breakthrough Tips and Drills"
This book has NEVER been available to buy online... Yours FREE when you order "The New Four Magic Moves To Winning Golf". Exclusive! As a super added bonus to "The New Four Magic Moves To Winning Golf", I'm including a FREE copy of my ebook, "How To Easily Cut 3 Shots By Knowing The Rules"
This Let me spell it out to you - if you don't know the rules there is no way you can benefit from them. Don't make the same costly mistakes I have made, you now have the opportunity to lower your score without even hitting a ball! Rule 13-4: If a player has hit the ball from within a bunker but his ball remains in the bunker, he is allowed to rake the sand; however, he should not touch the sand with his club. Should a ball be hit out-of-bounds from within a bunker, the ball must be dropped nearest the point of the last shot within the bunker. Here again, the sand can be raked before the drop, but the club should not touch the sand. Benefit: Although the club cannot touch the sand, the raking of sand before the drop is taken can eliminate obstruction and provide an easier sand shot. Each rule is discussed in a way that will provide an understanding of the rule and how that understanding can be used to your advantage. On the course, the level of a golfer's confidence directly impacts his or her performance. If there were nothing else to be gained, the confidence that comes from knowing the rules would be an immediate benefit. As you will see, however, there is much to be gained. Never Waste A Shot Again: "Rules Explanations and Benefits Exposed"
Can you relate to being uncomfortable on the golf course because you didn't know the correct ruling? Ultimately this FREE advice will save you many shots and increase your confidence ten fold when you order "The New Four Magic Moves To Winning Golf". Exclusive! As a super added bonus to "The New Four Magic Moves To Winning Golf", I'm including a FREE copy of Stephen's ebook, "Renegade Mind Tricks for Golf Special Report"
This Special Report contains three rather different, and dare I say "spicy" techniques, that will change the way you think about the mental game of golf. These techniques come from the peak performance trainings of Neuro-Linguistic Programming (NLP). They can be used not only on the golf course to slash strokes, but in almost any area of your life to great benefit. The first one is called Anchoring, and it will allow you to instantly move into your peak performance mindset. The second one is called the Swish Pattern, and I'll show you how to use it to become completely confident on the golf course, regardless of the situation. And finally, the Brain Scramble (sounds dangerous, but it's not) is a quick and easy way to let go of bad experiences from past rounds. "Quickly and Easily Diffuse Negative Emotions After a Poor Shot and Get Back in the Zone"
Granted, these tricks and techniques are a bit "outside of the tee box". However, the results that golfers from around the globe have achieved using these methods are just as uncommon. Grab Stephen's special report FREE to when you order "The New Four Magic Moves To Winning Golf". Exclusive! As a super added bonus to "The New Four Magic Moves To Winning Golf", I'm including a FREE copy of my ebook, "How To Get A Great Golfing Attitude"
Gail is a trainer for the PGA CPD programme and tours UK golf cubs conducting talks on how to play golf with confidence to all standards of golfers. Not only that, she coaches many individual tour golfers including Alison Nicholas who is our ex-US Open Golf Champion and who has just been announced at the 2009 Solheim Cup UK and European Captain. Gail offers top notch advice and tips, so much so Glen Muir one of the leading prestigious golf clothes companies in the UK (these are the guys that did the clothing for the Ryder Cup) sponsor her. How would you feel if you knew that every time you arrived at the Golf Club to play a round you were in the best frame of mind possible and ready to enjoy whatever the unpredictable game throws at you? Discover Gail's Secret to feeling great about your game when you receive "The New Four Magic Moves To Winning Golf". I know this Remarkable Book and Audio Course will Work Wonders for YOU! It will become your favourite club in the bag. And thus I want to ensure that everytime I update it you will receive a FREE copy. ... Once you try it, you will be blown away! This is a terrific deal - all 6 bonuses for free when you reserve your copy of "The New Four Magic Moves To Winning Golf". � Let Me Make You A Solemn Promise..."
I'm Offering A 60-Day "No Questions Asked & No Hard Feelings" Risk Free Money Back Guarantee� Yes, Thats A FULL TWO MONTHS! Don't say "yes" right now. Just say "maybe." Give it a try. Add to cart, go through the 4 New Magic Moves, learn the secrets and take everything at your own pace. The course comes with a no-nonsense, no-questions, no-stress, no-hassle, two full months, full money back guarantee of its purchase price. If for any reason whatsoever you decide this course isn't right for you, just let me know anytime within the next two months and I'll will pay you back in full. That�s a whole 60 days to evaluate it yourself and put these steps to the test. Now that�s more than fair! Apply what you discover in this course to your own golf game. And within two full months, I'm completely confident that your "maybe" will turn into a resounding "YES!" But The Perfect Golf Swing Doesn't Have To Be!" 12 Audio MP3 files - over 5 hours! - You have the option to download the whole book as one file. 12 iPod Audiobooks - 372 amazing minutes! - Also download the whole book as one file if you prefer. BONUS #6: FREE "FREE Life Time updates To "The New Four Magic Moves To Winning Golf!!" As you can see, this is a power-packed book and audio course that delivers everything you need to know about playing golf like a pro... And it's easy to learn, easy to digest and easy to use! And with new improved step-by-step formatting, how can you go wrong? It really is your guide that offers you the key to unlocking the vault of mystery behind effectively playing golf that will totally astound your friends. Join me as I show you how to "crack the code" and stay ahead of your fellow golfers. Get your copy of the "The New Four Magic Moves To Winning Golf" right now and discover what is possibly the easiest way to learn to play superb golf. Add to cart today! The complete course will be rushed to you immediately. No shipping charges to pay! "The New Four Magic Moves To Winning Golf" runs on both PC and Macintosh computers. Your order will be processed by Clickbank one of the largest and most trusted payment providers on the internet, processing tens of thousands of orders every day . They accept Visa, Mastercard, American Express and Discover credit cards Visa Debit / Delta debit cards and will even let you use your PayPal® Account. Clickbank use the strongest security and antifraud technology currently available. Upon completing your order you will be instantly forwarded to a secure web page where youll get instructions on how to download The New Four Magic Moves To Winning Golf  course and your 6 Special FREE Bonuses. How excited will you be when you significantly improve your golf swing over the next couple of weeks? P.S. I urge you to reserve your copy today. Right now. Do it before it's too late. Unless you take action right NOW and grab "The New Four Magic Moves To Winning Golf", quite frankly nothing is going to change in your golf game. Nothing. Nadda. Zero. P.P.S. Most importantly... You'll be amazed at how simple and easy it is to start playing better golf with "The New Four Magic Moves To Winning Golf". You won't need to spend another cent or penny again when I show you all his secrets... completely at my risk! PLUS, since I just launched this new version, you can get it right now at $37.05 off. It's as black and white as that. Don't hesitate - add your copy to the cart right now. Bonus #1 "Fit To A Tee - Discover The Missing Link To Playing Your Best Golf" by Mike Pederson... A $27.97 value but yours free! Bonus #2 "The Top Thirteen Sure-Fire Ways To Hole Every Putt" by Andy Anderson... A $19.97 value but yours for nothing! Bonus #3 "How To Easily Cut 3 Shots By Knowing The Rules" by Andy Anderson... A $27.97 value but yours for nothing! Bonus #4 "Renegade Mind Tricks for Golf Special Report" by Stephen Ladd... A $19.97 value but yours for nada, zippo! Bonus #5 "How To Get A Great Golfing Attitude" by Gail Smirthwaite... A $19.97 value but yours on the house! Bonus #6 FREE Life Time updates To "The New Four Magic Moves To Winning Golf!" ... A $97 value but today free! P.P.P.S. "The New Four Magic Moves To Winning Golf" is your simple step-by-step blueprint to understanding how the golf swing works. You have our two full months, 100% money-back guarantee to fully evaluate and use the strategies presented in "The New Four Magic Moves To Winning Golf". Don't like it? Just ask me for a full refund, you don't even have to send us the course back. You can even keep all the bonuses. You'll agree I can't be fairer than that! P.P.P.P.S. If you continue to play golf the same way, you're going to get the same results. What I'm offering you is the easiest, most risk-free way to try "The New Four Magic Moves To Winning Golf" so you can see for yourself how the four magic moves can improve your golf and help you achieve the consistent swing and lower scores you have always wanted.